Checking your dog for fleas can and should form a regular part of your canine maintenance rituals, it isn’t just a dog who scratches that could be infected. As the saying goes – a stitch in time saves 9. Well, in the case of fleas, it can save a lot more than 9 bites since a single flea can actually bite up to 400 times per day! Once on a pet, an adult flea prefers to spend all their life there. And who could blame them, a nice warm blanket of hair covering an ever ready food source sounds like flea heaven! A female flea can lay up to 50 eggs per day which can drop off your dog into your home. These hatch to form tiny larvae. Larvae hate light and try to crawl away from it as much as they can, deep into carpet pile, crevices in skirting boards, under sofa’s, in bedding. Once there they spin a protective cocoon and develop into an adult flea. These cocooned fleas are hardy critters and can survive in your home for anything up to a year. Once mature, they wait for heat and vibrations to stimulate them to hatch as this means there is a host around. After emergence as a fully-fledged adult flea they hop onto your pet – or even you! – And the whole cycle starts again. Adult fleas only make up 5% of the total flea population in an infected household, which means 95% of fleas are around you but you can not see them! Apart from the adult flea, the other stages of the life cycle are extremely small. The larvae hide so far away from light that it would take a powerful magnifying glass and a lot of effort to be able to spot one hidden away. 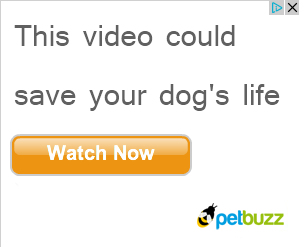 So remember, if you see a flea on your pet, which may not even be half of the story. As well as causing an itchy bite, some animals can develop terrible allergies to fleas. It is more common than you may think, with flea allergy dermatitis affecting up to 15% of the total dog population. A single flea bite can cause an appalling, irritating skin reaction leading to substantial fur loss, redness of the skin and a generally depressed pet. It is all down to being sensitive to flea saliva, which is reported as being the most irritating substance on the planet – quite impressive for an insect only 1mm long! It is vitally important to try and keep these animals flea free. A small fact with an important consequence, fleas can also transmit tape worms. If your dog accidentally swallows an infected flea, say through grooming, it could lead to tape worms developing inside your pets intestines. Therefore if you have found a flea infection, it is important to consider worming your pet too. This should be quite easy. 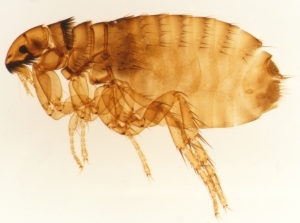 Adult fleas are about 1mm long, dark brown – black critters. They are very fast moving so you are unlikely to be able to pluck one from your pet’s coat. There may only be a few adults present at any time, so even if you don’t see any scurrying around, it does not mean your pet can’t have fleas. What A Flea Really Looks Like! The best thing to look out for is the tell-tale sign of flea dirt. This is effectively flea faeces and is made up of dried, ingested blood. It looks like tiny black, shiny flecks of pepper in amongst your pet’s fur. The best place to spot this is around your pet’s rump – just behind the base of the tail above the hips. Here fur is at its thickest making it the prime spot for fleas to hang out. To check the black spots are flea dirt and not just a bit of mud, try and dab some flecks off onto a piece of damp cotton wool. Leave the cotton wool for a few minutes. If a reddish tinge develops around the flecks, this is blood and proves you have a flea problem. There are many products available to protect your pet from fleas. It is worth remembering however, that only 5% of fleas are actually on your pet itself. 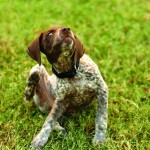 Therefore, to provide full flea protection it is important to treat your home as well. 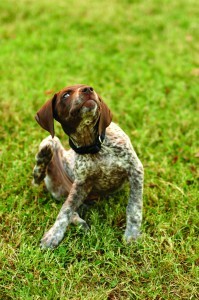 @K9Magazine Had no idea flees could jump 150 times their size. Yikes!